Datta, the son of Atri and Anasuya, is considered Adi Guru, the first teacher. 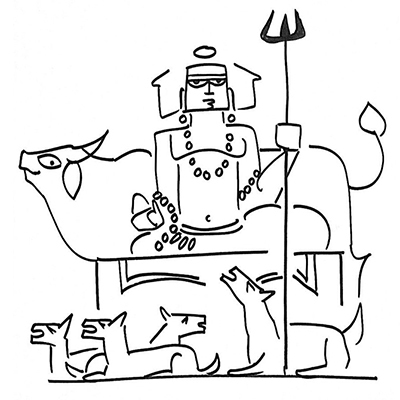 He is visualised as under a banyan tree with a cow (who provides) and four dogs (who protect), while he enlightens. Who was his teacher? Nature, he replies. In the Avadhuta Gita he describes 24 observations that gave him insight as his 24 gurus. 1. From the earth, he learned patience. 2. From the wind, he learned how movement within and without established the breath of life. 3. Fire revealed how all things, when destroyed, turn into the same indestructible essence. 4. Water revealed how to refresh things. 5. Sky revealed the nature of God, present everywhere, witnessing everything. 6. Ocean revealed the nature of the mind, full of restless waves but restrained by the shore or the body. 7. Sun that grabs moisture and creates rain-bearing clouds revealed the cyclical transformation of things. 8. Moon that waxes and wanes revealed how nothing lasts forever. 9. Swan that mates for life was caught by a fowler, and separated from its mate; it revealed how relationships can end, for no fault of ours. 10. Kite that was attacked by larger eagles for the meat in its talons, but was left alone as soon as it dropped the meat, revealed the power of letting go. 11. An attack on a beehive by bears seeking honey revealed dangers of hoarding. 12. Butterfly collecting nectar without harming the flower revealed how a hermit should take only that much alms from a householder that does not hurt the household. 13. A snake travels alone and never stays in one place for long; it revealed how a mendicant should never be rooted to a single spot. 14. Python that waits for food to come into its mouth revealed the power of accepting whatever opportunities come our way. 15-18. Moth that dies because it is drawn to fire; male elephant that loses control when aroused by the pheromones of the female in rut; hunters who play the flute can trap deer; and fishermen, who use worms as bait to catch hungry fish, revealed how the sense organs — moth’s eye, elephant’s nose, deer’s ear, and fish’s mouth — entrap us in the world of death. 19. Baby, who cries when hungry and laughs when happy, revealed how its emotions are temporary and bound by need. 20. A young cook, whose bangles kept making noise as she pounded the grain until she removed all of them, but one, revealed the power of isolation and how company leads to gossip. 21. A damsel, who was happy when lovers came to her but tormented when they did not, revealed how true happiness exists when one is not dependent on external factors. 22. An arrow-smith, who was too busy sharpening his arrows to notice the king’s arrival, revealed the power of concentration. 23. A spider’s web revealed the interconnectedness of life that has one single source. 24. The Bhrungi bug’s buzz that makes a captured caterpillar mimic it, revealed how positive words arouse positive thoughts and negative words arouse negative thoughts. These are important lessons in these modern times when gurus are less interested in provoking insight in disciples, and more interested in creating fans, followers and consumers.